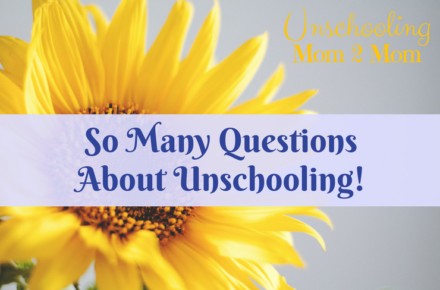 My kids are still in school, what's the best way to learn about unschooling? Join our FB group to ask questions. Find out what's available to you locally - a quick google check will do this. Or join a local group to ask more questions. My kids are under "school age." Do you have any info for me? I need a little more "hand-holding." Can you help me? Yes. Sue Patterson offers a variety of coaching/mentoring services for families who need more help. Now that her own unschooled kids are grown, she is happy to share what worked and what didn't! How do unschoolers learn to read? I keep hearing the word "deschooling." What does that mean? Deschooling was a term coined in the 70's to mean undoing some of the conditioning that schools have created in our brains. Parents and children often need to deschool, as the school's version of learning really permeates our society. In a nutshell, when a family deschools, they start to see that there might be multiple ways to learn something - as opposed to only one right answer. They start to see that play is an important way children learn - and not to be avoided by those who want to "get serious about their learning." Read the articles we've collected to understand how you may need to undo some of the schoolish thinking that holds you back. Go to the Deschooling articles, videos, etc. What do you do about record keeping? Some states require some minimum record keeping, but not all. We recommend that you do only what is asked. Don't try to prove that you're doing a good job by flooding them with info they haven't requested. As for your own record keeping, unschoolers find all kinds of ways to record what they've been learning. Scrapbooks, photo journals, blogging, Evernote-type systems are among some of the ways parents and children can record the day-to-day activities. Kids do love to look at themselves usually - be sure to take a lot of photos! It is required in a few states - but not the majority. Schools have convinced us to believe that learning can't exist without testing - but again, not true. Testing is a mechanism needed when you have school types of teacher:student ratios and/or the teachers have to report back justifying what they've been doing. Unschooling parents don't have either situation. Simple conversations with children can replace those weekly quizzes... and before you know it, you won't have any desire to prove your child's progress through a test. Some unschoolers prepare for the SAT and ACT exams just as other teens do. They get the review manual and/or take a prep class. Others bypass them altogether by starting community college and then transferring to a local university. Transfer students present their college records instead of the SAT/ACT scores. More about Getting Into College. What about unschooling teens - can it be done? More and more teens are realizing they have options for their middle and high school years. Unschooling helps them learn more about themselves, bolsters their self esteem - and often removes them from some fairly hostile environments. If you'd like first-hand stories of what life has been like for these teens, check out Sue Patterson's book: Homeschooled Teens. Read more here at the website about teens and unschooling. What if my kid wants to play videogames all day? Technology is the wave of the future - there's no putting that genie back in the bottle! And unschoolers are embracing it in all sorts of ways. Find out more about how we have a stigma against kids using and playing with technology - and sometimes progress in general! We've collected a lot articles, blogposts, videos, and podcasts about looking at the benefits of playing with technology. Go to our collection. Where can I find a conference? Conferences are fabulous ways to get to know other unschoolers. Perfect if you live in a community where unschoolers seem to be hard to find. Some families go to the same conferences every year and it becomes an awesome annual reunion for everyone. Teens, especially, find conferences to be a lot of fun. How do unschoolers get into college? Colleges are eager to have homeschooled and unschooled applicants! Many do well on the SAT/ACT - prepping like everyone else just before the test. Even more start as dually enrolled high school students, taking a few classes at community college as teens. Then, as transfer students, they easily move into the local university setting. More about getting into college. My spouse needs some convincing - any ideas? Here are some books and articles about unschooling that we recommend. But maybe he needs something that will wake him up. Our collection of articles and videos at What's Wrong with Schools Anyway? might do that. But it all depends on what the particular issue is. Joining our facebook group may help you get a variety of ideas for how others have dealt with spouses with doubts. Join Unschooling Mom2Mom Group. What about naysayers in general - family members, friends? Sue did a great video for coping with rude relatives over the holidays. This might be good to watch: Naysayers on Youtube. It's also a topic we talk about frequently on the Unschooling Mom2Mom group - you're not alone. But redefining boundaries is going to be important. It's also important to identify if these naysayers are having an impact on your children. A few articles that might help. "What's Wrong with Schools, Anyway?" Do you hear this from well-meaning friends and family? It's kind of surprising, considering the headlines year after year. So, the one gloomy part of our otherwise optimistic website... we've collected articles to remind people of the research, the commentaries, and the real life examples of what IS actually wrong with schools these days. A lot of families are able to juggle schedules or create a support network for their family. In the meantime, we've collected some articles that help show how others have managed, as well as some links to ideas for living frugally. Parents who work. Can anyone share a "typical day?" Unschooling families' days are usually not very typical at all! Thinking of how you spend summer vacation or Saturdays is a good starting place. We caution families about too much comparison though. The best cues to what you "should" be doing is connecting with your child and seeing what they enjoy and what they'd like to do more often. That's the big "jumping off place." Typical Unschooling Days. Is unschooling just for rich people? How can I afford all the things that my kids want? Ahh.. the parent's lament, right? Obviously, most of us can't get EVERYTHING they want for them. But there are ways to work within the limits of our budgets. We've collected some ideas you may be interested in. Unschooling on a Budget. Many unschooling families notice that the way kids learn to read can also be applied to how they learn to cooperate within the family. These parents apply unschooling principles to their parenting. When a family opts for a non-punitive, relationship-based, non-authoritarian approach, it's called radical unschooling. Don't let the term turn you off - find out more about how this can work in your home too.